More and more parents are choosing Chinese immersion schools. Most love them - but some are getting more than they bargained for. Elizabeth Goumas’s top criterion in choosing an elementary school for her kindergarten-bound son, back in 2009, was that it be within walking distance of her house. “If there were an earthquake, I wanted to know that I could get there,” she says, half joking. School leadership, diversity, and a supportive community were all close seconds. What wasn’t a priority, whatsoever, was a language immersion program. “My husband and I had totally ruled out immersion,” says Goumas, a blond, blue-eyed former software sales executive. “We thought it was too complex, too much to take on.” Chinese immersion wasn’t even on her radar. In 1981, the first Mandarin immersion school in the country—the private Chinese American International School (CAIS)— opened on Oak Street in San Francisco. West Portal Elementary followed three years later, becoming the nation’s first public elementary school to offer a Chinese immersion program. 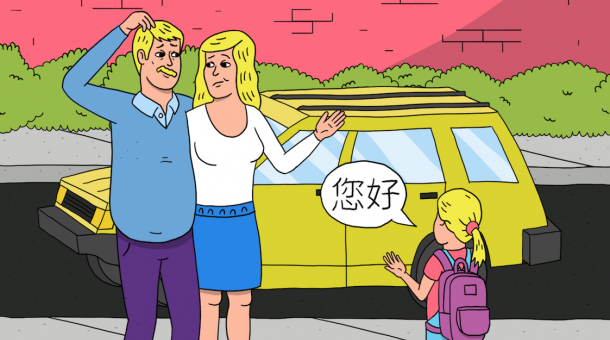 Since then, as China’s role in the world economy has grown, so has the number of non-Chinese parents (and second-, third-, fourth-, and fifth-generation Chinese-American parents) who want their kids to learn the language spoken by 1.2 billion people. This fall, San Francisco will have a total of 14 Chinese immersion programs. Eleven are public, most at the elementary and middle school levels. Half are Cantonese, half Mandarin—and all are in high demand. Some operate as a separate language program within an otherwise conventional school; others, like De Avila and Presidio Knolls, a private K–8 Mandarin school launched in 2012, are full immersion. All in all, roughly 2,700 students are enrolled in Chinese immersion programs in the city. And more are coming. Alameda County got its first Chinese public immersion school, Yu Ming Charter, in 2011; it receives four applications for every available spot. Next year a public school in Redwood City is introducing Mandarin immersion, and parents are clamoring for Mandarin immersion schools in Menlo Park and San Jose. In total, there are about 50 Chinese immersion schools in California, most of them in the Bay Area. It’s also about rote memorization—and ridiculously difficult. To be considered literate, one must learn about 3,000 Chinese characters. And when it comes to learning those characters, the younger the better. Prime time is kindergarten and first grade, when children’s brains are like sponges and everything is new—washing hands, tying laces. Why not tack on Cantonese, too? And these assimilated days, no one has a leg up. Most kids in the immersion programs, whether Chinese-American, multiethnic, or Caucasian, are starting from scratch. Some may have attended Mandarin preschool, but about 90 percent of families who choose Chinese immersion education, Weise estimates, don’t speak the language at home. Families who do tend to be more concerned that their children master English, so they choose all-English programs. And newer immigrants may not even be aware that immersion programs exist. Income levels skew somewhat higher at Chinese immersion schools, Weise adds. In 2012, for instance, the number of Chinese-immersion students who qualified for reduced-fee or free lunch was around 34 percent, versus the district-wide 61 percent—at De Avila, it was only 17 percent. But that’s by no means universal, says Weise. And for parents who view private school as the pinnacle, getting into a Chinese immersion program is a “golden ticket”—they get an academically strong school without having to pony up $25,000 in tuition. Sophie Wallace, a white French woman married to a white American man, has kids in the fifth and eighth grades at AFY. She raves about their experience, academically and socially. “The great plus is that the kids learn early on that they are not a majority, so they can’t be cocky,” she says.